Antonio Rudiger was brutally trolled by keen-eyed fans on Twitter this evening, after he was seemingly ‘headbutted’ by Everton’s Bernard in Chelsea’s 0-0 draw with the Toffees on Sunday. The Blues were held by Marco Silva’s side at Stamford Bridge, as they failed to convert any of the good chances they managed to create during the match. 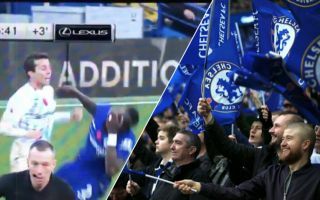 However, it wasn’t any of these chances that caught some fans’ eyes, but Rudiger’s reaction to being head-butted by Brazilian winger Bernard. Rudiger absolutely towers over the Everton man, standing at nearly a foot taller than him, so it seems weird that Rudiger would do what he did, something that looks like he’s tried to get the midfielder sent off. Here’s a video of Rudiger’s theatrics against Everton earlier, and the trolling of the German that followed on social media. We found some of these tweets hilarious! 6 foot 3 Rudiger rolling around holding his face because 5 foot 5 Bernard who’s head only comes up to his chest apparently butted him in the nose ???? ?